by Chris Woodford. Last updated: September 11, 2018. Has there ever been a more amazing invention than the pen—an incredibly convenient way of recording information that dates back thousands of years? The only trouble is, pens and paper are not very compatible with the digital technology that surrounds us in the modern world. It's all very well scribbling little notes to yourself as you sit on the train, but what if you need to put that information into your computer when you get home? Until recently, your only option would have been to read back your notes and type in the information (that is, write it out all over again)—but now there's a better solution: the digital pen. Digital pens look like fatter versions of ordinary pens. Packed with electronic circuits, optical devices, and Bluetooth® gizmos, they can record the things you write as you write them and transmit them automatically to your computer using wireless technology. Sounds amazing doesn't it, so how exactly does it all work? Photo: A Nokia SU-27W digital pen. It's about four times fatter than a fountain pen, a little bit longer, but not all that much heavier. This one is no longer available, but there are plenty of similar ones on the market. 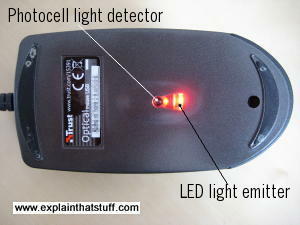 Photo: An optical computer mouse has much in common with a digital pen. Turn it over and you can see the light that shines onto your desk and the photocell that picks up its reflection. Chances are you already own something quite like a digital pen. If you have an optical mouse (one that works by shining light onto your desk instead of using a heavy, rolling, rubber ball), you're already using most of the technology that a digital pen uses. If you lift up an optical mouse, you'll see there are two optical components underneath: one that shines red light down onto your desk and another one that detects the light as it bounces back up again. The light is produced by a light-emitting diode (LED); right next to it, there's a photoelectric cell—a component that detects the reflected LED light and turns it back into an electrical signal. As you move your mouse around, the pattern of red light reflected off the desk changes from one moment to the next and the circuits inside the mouse use this to figure out exactly how you're moving your hand. Now, clearly, you could write words with your optical mouse if you wanted to and they would appear on your computer screen—but they'd appear as big, fat, smudgy images not as clearly discernible words: your computer would have no idea what you'd actually written and it would be impossible to import your scribbles into a word-processor to edit them. What's different about a digital pen? 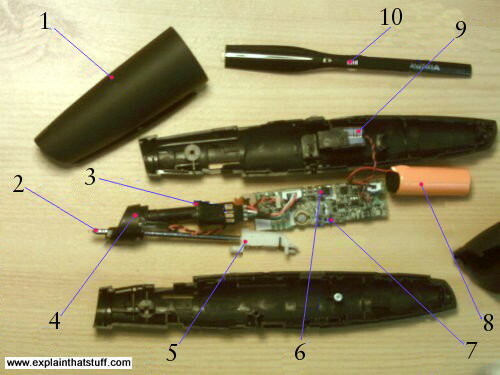 If you look inside a digital pen, you'll find most of the same components that are in an optical mouse. The difference is that they're stacked vertically rather than horizontally: a digital pen is to an optical mouse what a skyscraper is to a parking lot. Where an optical mouse tracks your hand movements by reflecting light off your desktop, a digital pen does the same thing much more precisely by following an almost invisible pattern of lines or pinpoints (depending on which system you use) on special paper. The ink refill leaves an ink trail on the page. You can see this but the pen can't. The infrared LED in the base of the pen shines onto the page. You can't see it because your eyes can't detect infrared. The light detector, also in the base of the pen, picks up the infrared reflected off recognition marks printed on the special paper. The Bluetooth antenna built into the pen transmits the stored data wirelessly and invisibly through the air. 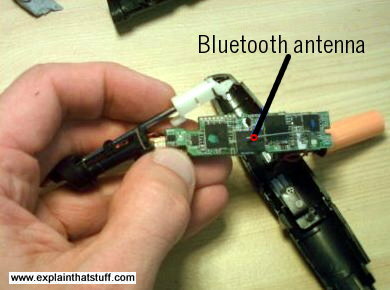 The wireless receiver in your computer picks up the Bluetooth signals and stores what you've written. Software in the PC converts this data into normal, editable text you can import into a word-processing program. What can you use digital pens for? Some are like thin, handheld scanners. They're designed to turn printed text into editable text on your computer using OCR (optical character recognition). IRISPen is a popular example. Some are designed to "import" ordinary handwriting into a computer as editable text. Pens like this come with a PC software package that imports the data the pen has stored and decodes it, turning your scribbled handwriting into editable text as good as you could have typed from the keyboard. Some work by reading or tracking complex printed patterns from the paper and are mainly used for filling in order forms (though they can also do things like handwriting recognition). It's a bit of a misnomer to call these digital "pens," since they're essentially just text scanners and don't actually write anything; you'll sometimes see them described as "pen scanners" or "OCR pens." Some are battery powered and have onboard flash memories to store things you scan as you're out and about; you simply upload what you've scanned when you get back to your computer. Others have long USB cables, so they work exactly like conventional scanners but are a bit more portable, if you hook them up to a laptop. More sophisticated digital pens are designed to capture your handwriting. Now, if you're a fan of old-style technology, particularly classic technology like the pen and paper, digital pens might seem completely frivolous—but just consider for a moment how useful they could be in certain situations. If you're a student taking notes in classes or lectures, imagine how brilliant it would be to get back to your room, immediately upload all your notes to your computer and instantly print them out in neat, typed form. Or, if you're a physician (doctor), wouldn't it be handy if all the notes you scribbled about a patient during an examination could be instantly uploaded onto their records as soon as they left your consulting room? Digital pens have some pretty cunning new uses as well. The company that devised much of the technology behind the latest generation of pens, Anoto, envisages them as a super-convenient way of ordering information from websites. Their brainwave was not to produce better digital pens but to reinvent paper so that it's overlaid with an extraordinarily complex, almost invisible pattern that's easy to vary for different purposes. So, for example, an election voting paper would have a different pattern from a mail-order catalog ordering form, and a mail-order form printed by Sears would be different to one printed by Macy's. 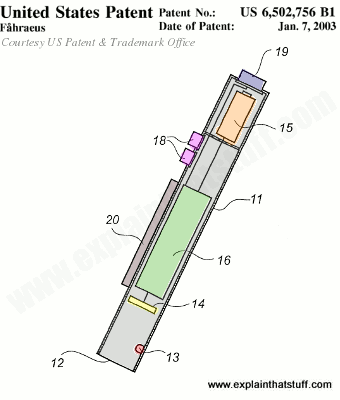 Photo: Anoto's digital pen (shown here in their original patent illustration) looks very much like the Nokia one I've taken apart in this article. Using their numbering (but with my colors added for clarity): 11 (gray) is the pen casing; 12 is the opening at the bottom of the pen through which light fires down at the paper and back up again; 13 (red) is an LED; 14 (yellow) is a light sensor (either a CCD or CMOS sensor); 16 (green) is the main circuit board; 20 (brown) is a digital display; 18 (purple) are buttons for switching the pen on and off or controlling simple menu functions; 15 (orange) is the battery; 19 (blue) is the wireless transmitter. Artwork from US Patent 6,502,756: Recording of information by Christer Fåhraeus, Anoto Ab, 7 January 2003, courtesy of US Patent and Trademark Office. Imagine if you wanted to order a Chinese take-away through a website. It can be quite irritating to have to switch on your computer, wait for it to boot up, go online, fill in one of those lengthy forms, enter all your payment details, and finally wait for your food to arrive. It's so much quicker to do that by phone or on paper. So Anoto's idea is that takeaways (and other companies using online ordering) would print their catalogs or menus with their own unique version of its specially coded paper. People could then tick the things they wanted with their digital pens. Because of the unique pattern, the pen would instantly know which company website the form referred to and send the orders through to the correct place in a fraction of the time. When I first wrote this article, back in 2008, Anoto was still quite a new technology, and I commented: "Given that it marries the simplicity and convenience of pens with the power of computers, it could have a very promising future." Looking back now, it's well over a decade since Anoto was granted its patents and the system is still relatively uncommon. Smartphones with intuitively easy-to-use touchscreens that automatically know where they are, faster mobile networks, and very usable apps have combined to make online ordering much quicker and simpler than ever before. Most of us own a smartphone and order from it all the time; how many of us own a digital pen or have ever seen digital paper? Meanwhile, bigger-screen tablets and phablets have come along, replacing paper notebooks altogether for many people. If you're happy writing notes straight on your tablet, why bother with digital paper at all? Handwriting apps like INKredible can replicate much of the elegance of real-world handwriting, even when you write with your finger. Did Anoto, obsessed with finding markets for a very clever digital pen-and-paper system, simply fail to understand how touchscreens would come to dominate the world? Was it way ahead of its time? Or a flawed idea whose time would never come? The digital pen makers don't give up easily! LiveScribe (bought by Anoto in 2015) is also targeting the corporate market, while Leapfrog packages similar technology in a colorfully chunky pen designed to help children learn to read. The latest generation of handwriting pens (like the Neo Smartpen, Moleskin+ Pen, Montblanc StarWalker, and Livescribe) are specifically geared for use with smartphones and come with their own dedicated iOS and Android apps. All these systems are based on coded paper. 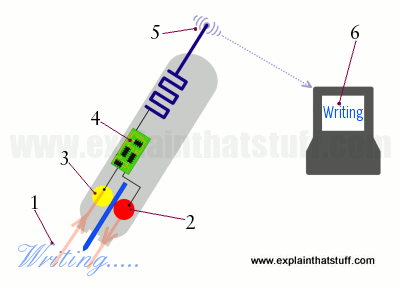 What's inside a digital pen? Pen cap: Nothing hi tech about this. It just keeps the ink off your clothes and protects the light detector. Ordinary ink refill: Leaves a trail on the paper so you know what you've written. Docking connector: When the pen sits in its docking cradle (not shown), this connector charges the battery and downloads your words, via the docking station, to your computer. Pen optics: This compartment holds the most important parts of the pen: the LED light that shines onto the paper and the photocell that detects the reflected light. 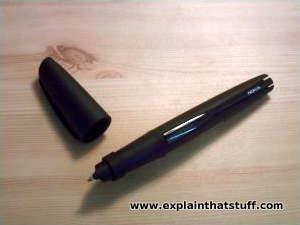 Unlike an optical mouse, a digital pen uses invisible infrared, so you can't actually see the light it uses. Refill holder: It's as low-tech as it sounds: it's a simple piece of plastic that holds the ink refill in place. Indicator lights: These shine up through the pen case to tell you when the pen needs recharging, when it's full of words, and so on. Reset button: You can push a tiny little rubber button on the base of the pen case to reset it. Rechargeable battery: This should last a few years at least. Vibrating motor: Have you ever wondered how cellphones (mobile phones), pagers, and other mobile devices give you one of those vibrating alerts? Here's the answer. It's a tiny electric motor with a wonky bit of metal on the end. As the motor spins, the wonky metal wobbles around on the end making the whole thing shake like a badly loaded washing machine. Indicator lights on pen top: The lights on the circuit board shine up through transparent areas on the plastic pen case. Photo: Antenna: Look at the back of the circuit board and you'll see the tiny little Bluetooth antenna (aerial) that transmits your words to your computer. It's a little bit thicker than a pin. There are some more chips round the back too. Gadget Fanatics, Take Note by David Pogue. The New York Times, 8 May 2008. A look at LiveScribe's new smart pens. Pen computing: not just for kids by Tekla Perry. IEEE Spectrum, January 30, 2008. Explores a couple of examples of how digital pens are being used by both adults and children. Electronic voting 'world first': BBC News, 27 September 2006. How digital pens have been used for voting in Scottish elections. Electronic pen has yet to make its mark by Chris Oakes. The New York Times, July 11, 2005. Why has Anoto failed to take off? DigiPens Search for Write Market by Michael Stroud. Wired, 21 December 2002. How various manufacturers are slowly developing digital pen technology. The Hot New Medium: Paper by Steve Silberman. Wired, Issue 0.04, April 2001. A long article about Anoto's digital pen and paper technology. From paper to the Internet by John Wurtzel. BBC News, 4 September 2001. A shorter article, also describing Anoto's system. Pen-and-Paper User Interfaces: Integrating Printed and Digital Documents by Jürgen Steimle. Springer, 2014. A comprehensive overview of current digital pen and paper technology. Quite academic and theoretical, but with plenty of practical advice too. Nurturing Science-based Ventures: An International Case Perspective by Ralf W. Seifert, Benoît F. Leleux, Christopher L. Tucci. Springer, 2014. "Case 6:4: Getting the io™ Digital Pen to Market", p.667, describes some of the business background to the digital pen market. US Patent 5,661,506: Pen and paper information recording system using an imaging pen by Mohamed Lazzouni, Sia Technology, 26 August 1997. An early digital writing system, quite similar to Anoto's, but filed a few years earlier. US Patent 5,852,434: Absolute optical position determination by Oral F. Sekendur, currently assigned to Anoto Ab, 22 December 1998. Another early patent with some similarities to Anoto's system. US Patent 6,502,756: Recording of information by Christer Fåhraeus, Anoto Ab, 7 January 2003. The original Anoto digital pen and paper patent. You'll notice that the emphasis in this patent is on the very clever positional coding system that the pen detects; the pen itself is a relatively minor part of their system. US Patent 20110310066: Digital Pen by Björn Fermgård et al, Anoto Ab, 22 December 2011. An alternative digital pen design from Anoto. US Patent 8,842,076: Multi-touch touchscreen incorporating pen tracking by Bernard Dorey et al, Rockstar Consortium, 23 September 2014. Describes how digital pens can be incorporated into touchscreen technology.